Get paid more, faster by providing patients a superior experience to paying online. Patients receive text and email messages with a link to view their eStatement containing what they owe and why they owe it along with payment options. eStatements are custom branded for your practice and make it easy for patients to pay their balance now or by enrolling in a recurring payment plan right from their mobile device. Patients are happy because they feel like you care about them by providing a private, convenient and budget friendly way to pay. Leverage modern technology designed specifically to increase patient self-payments. Our proprietary software removes the burden of following up on past due balances while enhancing your ability to collect. Your patients will receive eStatements through a series of friendly emails and text messages until a payment arrangement is made. These eStatements contain a pay-in-full option coupled with a menu of affordable monthly payment terms. This makes it convenient for your patients to pay their balance due in a timely manner. With today’s technology, patients expect a private and convenient means to pay their balance online. Mailing statements can be costly and ineffective while making phone calls can cause resentment toward your practice. 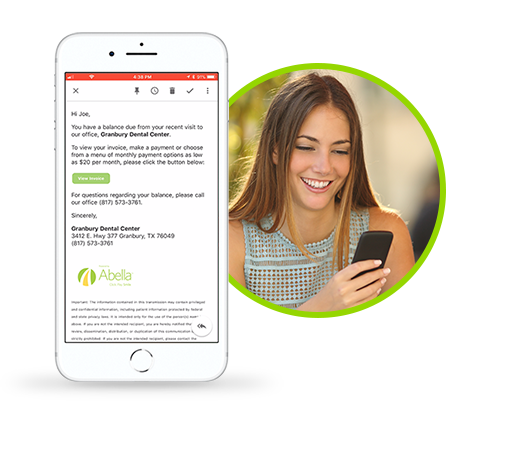 Abella enables you to show patients respect and compassion, creating loyalty by giving patients realistic options to resolve their balance due shows you care.